Vancouver is not only a bustling metropolitan core (it is the third largest city in Canada), it is also home to spectacular natural scenery, surrounded by water on three sides and nestled alongside the Coast Mountain Range. More importantly, though, Vancouver is a year-round playground for golfers as it boasts one of the mildest climates in Canada. Minutes from Vancouver International Airport, and a close drive to Vancouver's downtown core, is Mayfair Lakes Golf & Country Club. Offering immaculate course conditions, a unique links design, lush fairways and panoramic view of the North Shore Mountains... year-round. Whistler is already known around the world for its spectacular mountains, unsurpassed skiing and outdoor adventures. But more importantly, this picturesque valley is home to four of Canada's top 100 golf courses, including the legendary Nicklaus North Golf Course. 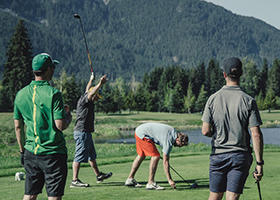 Golf Digest has rated Whistler as one of the "Top 20 Greatest Golf Destinations" in the World and Canada's Golf Course Ranking Magazine slotted Whistler in the top spot as the "Number One Golf Resort in Canada".